With a foot of fresh powder on the ground and snowdrifts that would give the Great Sand Dunes a run for their money, winter is still bearing down hard on in the northern latitudes. While I’ve got the gear to venture out and restock my pantry, I certainly don’t have the motivation. That’s why I always like to keep a butternut squash handy during winter. They last for months in a cool dry place, and are good for a hearty side or a luscious soup when mother nature decides to turn your neighborhood into a giant snow cone. I know some of you are going to look at the ingredients and wonder why I’d used plain old water instead of stock, but trust me, it doesn’t need it. By roasting the squash and garlic until nearly burnt, the Maillard reaction does its job in turning these humble vegetables into meaty umami bombs that will have vegan dinner guests accusing you of adding pork stock to the soup. 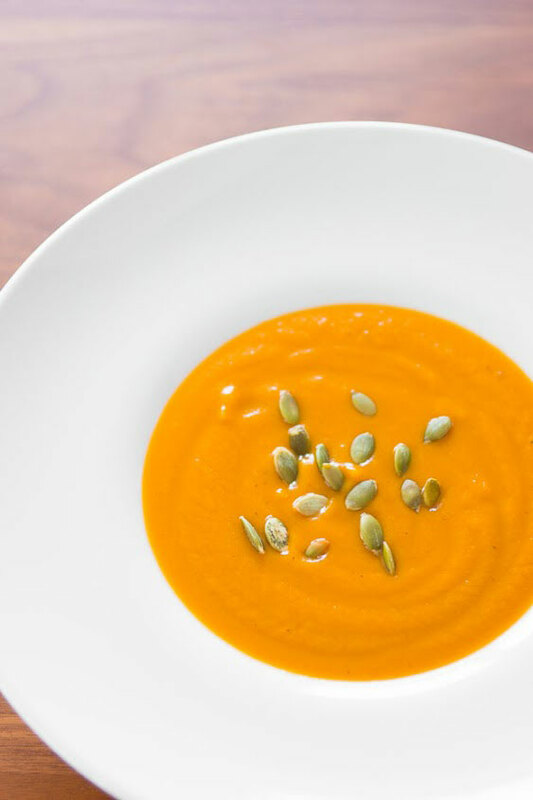 To finish the soup, I simply toss the roasted veggies in a blender along with some water and a bit of tahini and you get this striking orange soup. While there isn’t enough of it to contribute a sesame flavor, the small amount of tahini adds a subtle earthy undertone and gives the soup a tongue coating creaminess without a drop of cream. Most people tend to cut the squash into cubes or chunks, which makes it easier to eat if you’re having them roasted, but cutting them into thinner slices not only makes them roast faster, you also get more surface area for the squash to caramelize, increasing both the intensity and sweetness of the soup. 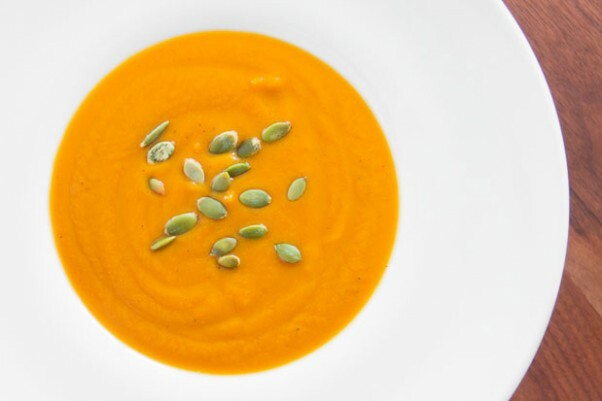 Food blogger Marc Matsumoto explains why this butternut squash and garlic soup recipe doesn't need cream or stock on the Fresh Tastes blog. Peel the butternut squash using a vegetable peeler. Trim the ends off the squash and cut it in half lengthwise. Scrape out the seeds. Cut the halves in half again lengthwise (so that it's quartered). Slice each quarter into 1/4" thick pieces and add them to a bowl. 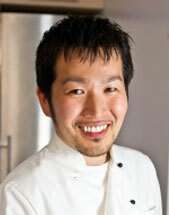 Remove the outer skin from the head of garlic, and break up the head into individual cloves, but do not peel the cloves. Add the garlic to the bowl with the butternut squash. 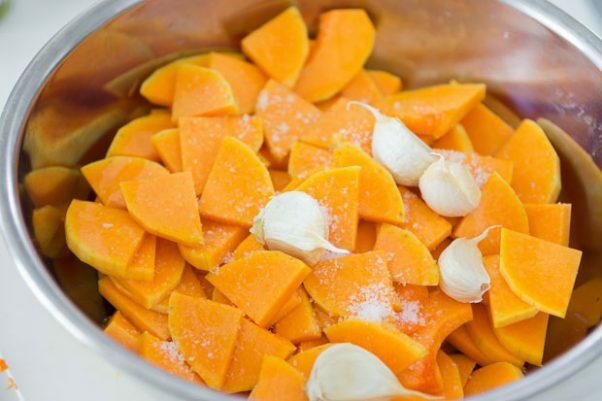 Toss the butternut squash and garlic with the olive oil and salt and then dump it all onto a baking sheet along with any oil and salt that's remaining in the bowl. Spread the squash around evenly and place them in the oven. Roast the squash for 25-30 minutes, or until they are golden brown. You want to take them close to, but not quite burnt around the edges. 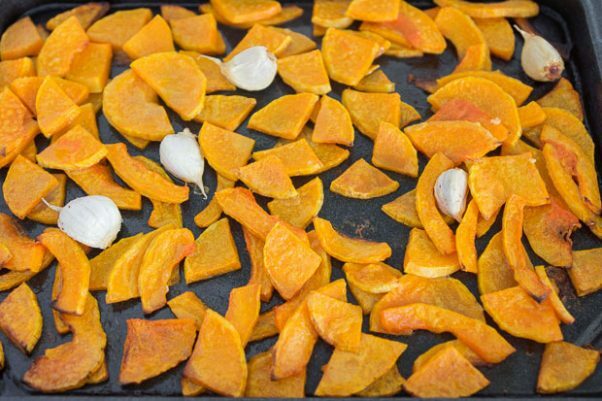 When the squash is done, remove it from the oven and pour 1 cup of water over it. Use a silicone spatula to scrape up the browned squash juices clinging to the pan. When the garlic is cool enough to handle, peel the cloves and put them in a blender along with the squash, liquid in the pan, tahini, and another 2 cups of water. Blend the soup until smooth and transfer to a pot to reheat before serving. Serve garnished with toasted pumpkin seeds and lots of good bread.